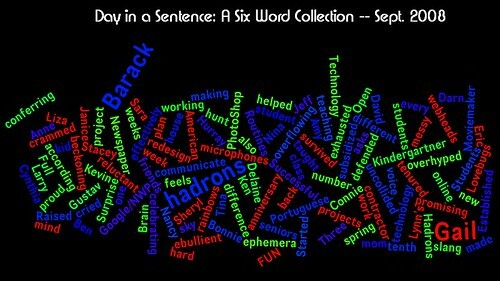 Greetings and here are this week’s collection of sentences. I want to start out with a podcast that I did with a roomful of teachers at the Prairie Lands Writing Project in St. Joseph, Missouri, on Saturday as part of a talk about Web 2.0 and the ability to use the Net for connecting with a community of other teachers (and a keynote address about writing my webcomic). I asked them all to write out a Day in a Sentence, and volunteer to podcast their sentences. Note to self: Lake George Friday, personal day, fun with darling husband, good weather forecast, Fort Ticonderoga! (Apologies for the fragmentation but those have been my thoughts all week long, like a countdown!) — Gail P.
We’re going to have a guest host this coming week so be on the lookout for that call for words. Please consider joining us for this week’s Day in a Sentence. No fancy themes this week. Just good ol’ fashioned sentences. How does it work? Boil down your week or a day in your week to a reflective sentence and share with the comment link on this post. I will collect all of the sentences and publish them (probably on Monday, at this point). As for me, I am heading off to the Prairie Lands Writing Project in Missouri this weekend to give a keynote talk about writing in the online world, with a focus on my webcomic, Boolean Squared. 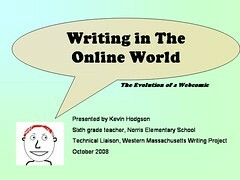 I will show how I used the Web 2.0 and other technology as part of a writing process for the comic strip, and then, how you might move some of those ideas into the classroom. The conference looks very interesting and I am very excited about being asked to present as the keynote speaker (this is the second time this has happened – Bonnie hosted me last year at the Hudson Valley Writing Project). My hope is to create an online version of my presentation in the next week or so. Meanwhile, one of my activities for the crowd in the morning (where I focus on Web 2.0 and education) is to write out a Day in a Sentence and then podcast some of their words as part of our own Day in a Sentence collection. It will add some new voices into the mix and bring Day in a Sentence out a bit further. I look forward to your words! Mr. Mansour got me right at the first line. Bacteria, viruses, rockets, and rocks. 6th graders still challenged by lockers with locks. Two student teachers and some nurses to boot. The best rocket maker might win some loot. Friday detention is a bit of a pain. This poem is confusing, let me explain. It’s my week in a poem, the life of a science teacher. I’m armed only with my cunning, a computer, and a beaker. Anne M. came back from behind the Great Firewall of Asia. Due a quirk, I felt I’d lost my arm. 21st Century is no time to be a wallflower as the dance moves on without you. and it’s like the stars. but can I survive the weekend? That bring them to learn. Like Liza, David was looking forward to the weekend. Perhaps the sniffles are gone? And Lisa C. added her poem called Late September to her blog site, capturing a hectic week. And started a few that are new. A novel was finished, all in one day! With more time to play. And start make plans for another great week! Thanks to all of the poets here. I decided to take all of the many submissions for this week’s Day in a Sentence (actually, it became Day in a Question with the theme), and use a site called Jog the Web, which allows you to set up a series of navigational paths for websites. I like that I can move you to the blogs and sites of all of the folks who added their words to our feature this week. So, without further ado, please tie the laces on your shoes and let’s hit the trail. I would love to get some feedback on the experience as a viewer, if you have time. Your Day in a Question? This suggestion comes from Gail P., who teaches at my school. 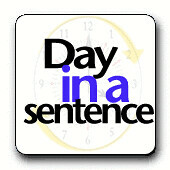 She came into the lunch room and said, Why not Day in a Sentence as an interrogative? Well, why not, indeed? We haven’t done that one before, so: Please reflect on a day in your week or your week, and narrow it down to a provocative question or query for us. Will this push into Professional Learning Communities will make our school more collaborative in nature or will it just tighten the circles around our grade level teams? I look forward to your words and invite everyone and anyone to come on board with this collaborative, community project. I was pleasantly surprised to see the rush of words come after I put out my first call for Days in a Sentence in about seven or eight weeks. The break was nice for me and I wondered if Days in a Sentence would still be on people’s radar screens. It surely was. And boy, folks can pack a lot of punch into just a few words. My colleague, Gail P. (whom I ran into on the beach in Maine while we were both on vacation) teaches kindergarten at my school. Her year got off to a good start. It’s all working according to plan. Connie continues to innovate with energy and enthusiasm, with positive results. Successful with class redesign, I’m exhausted. Delaine also moves into new territory and then crops out the things she doesn’t want. If only life were like that. Surprise! I am effectively teaching PhotoShop. Liza is another one who found that some thoughtful planning is paying off. Routines are making a difference — Hurray! David‘s six words remind of a day in my class this week, when my sixth graders came in talking about the new supercollider, and asking if the world were soon to blow up. So I talked science with them and also talked Media Exposure, too. David writes: Hadrons, hadrons, hadrons: subsidized, overhyped, uncollided. Sara made the rounds, checking in with students and making connections. conferring with every kid is hard! This was great. My Writing Project friend and colleague, Tina (who ran a claymation camp with me this summer) already has some students tinkering with tech. Moviemaker and microphones made students ebullient. Stacey was thinking of country, perhaps as part of the 9-11 ceremonies. I’m proud to be an American. Ben is no longer on the same pins and needles, thanks to longevity and experience. Open house feels different when tenured. I wonder if Janice feels like she’s on the narrow end of a time funnel? Three weeks work, crammed into one! Bonnie had Barack on her Brain. Barack is back, and me too. Full sky, beckoning spring,promising rainbows. Sheryl has some sort of construction going on. I hope her foundation is strong. Technology helped me communicate with contractor. Jeff had the tables turned on him, with students becoming the teachers (although I wonder what words he learned?). Students taught me some Portuguese slang. OK. I admit I had to look up the last word of Lynn‘s submission. And then it made sense. My mind is overflowing with ephemera. Kevin, along with my six (sort of seven) words, I’d like to add a quote from Marvin Marshall, an extraordinary writer on classroom management, who wrote that before we act, we should always ask ourselves this question: “Will what I am about to do or say bring me closer or will it push me away farther from the person with whom I am communicating?” Needless to say, I didn’t do that in this instance. Anne continues to push into new terrain. Established new friends for online projects. Nancy experienced that frenzy of the week where it is gone before you know it. What did I do this week? Amy K. had success by digging into the news. Literally. Newspaper number hunt messy and FUN! Cynthia is fighting off the Lovebugs (not Herbie!). Darn it! Lovebugs also survived Gustav. She explains: Those of us who live in the Gulf Coast states are cursed each September by an invasion of lovebugs, small black insects whose only purpose in life, as far as I can tell, is to procreate. They are nasty, disgusting, smelly, and invasive. They are supposed to be attracted to white houses. Someone forgot to point out to them that my log cabin is not white because I spent all Saturday morning vacuuming up these disgusting insects, but they just keep coming in. Nina is a decade old. Sort of. I’m celebrating the webheads’ tenth anniversary. The Day in a Sentence returns here this week with a request that you consider boiling down your busy lives — either as a day or the week — into a single reflective thought. This week, I am returning to the concept of minimalization: the Six Word Sentence. Everyone is invited (yes, even you) so please consider joining us. I defended technology before reluctant mom. In the span of the first day that I posted a call for Six Word Days in a Sentence, my blog was hit with 20 submissions. That says something about the power of the six words and the power of the Day in a Sentence format, doesn’t it? And the words kept coming the next day … and the next. By Saturday, I had more than 30 sentences in my blog bin. Thank you to everyone who lent us your words this week. I have been very protective of them, but now, they can be released into the world. I won’t say much this week in terms of introductions, as the six words (give or take), capture what the writers were trying to say. My own words would just jumble up the experience. What I did decide to do, however, is to group them according to some common themes that seemed to emerge (sorry if you don’t quite agree with my categories) and then it made sense to me to create a Bubble.Us concept map, color-coded along those themes. Graduation, celebration, culmination, year-end roll. — Lynn C.
Language immersion camp in full swing! — Amy K.
Lunch with colleague lifts my spirits. — Susan C.
Kids creating music blows me away. — Anne B. Relentlessly, the smoke fills our lungs — Lynn J. Wanted: Six Words. Your story. Here. It’s that time again — we’re looking for your Days in a Sentence and since so many of us in North America are entering summer vacation/break (but not everyone, of course), I thought we could return to the Six Word Story format in an effort to keep things brief and to the point. So, please consider boiling down your week or a day of your week into six words. You can use the comment feature on this post and then I will collect and redistribute the Six Word Sentences over the weekend as part of our growing network of writers. Thunderstorms wreak havoc on family activities. I look forward to your words this week. PS — If you are interested in guest hosting Day in a Sentence, please let me know. I love having other folks take it on from time to time.